After writing and filming one version of its pilot (and showing it at Comic-Con), the people behind DC Comics’ Powerless decided to completely revamp the show. That means that the new first episode, which aired last night, had a ton of major changes from the original—and here’s what they were. In the old pilot, Emily Locke (Vanessa Hudgens) was a long-time employee of the company, and she’d spent enough time living in Charm City to be deeply tired of superheroes and the damage they cause. The old pilot opened with Emily going off on Crimson Fox (Atlin Mitchell) for the way that innocent people keep getting dragged into the middle of the fights between superheroes and villains. In the new version, she’s not only excited about moving to Charm City, but being caught in-between her first superhero/villain fight. She even takes a selfie in the derailed train that she was trying to take to work. In the old pilot, Emily was one of the gang. Teddy (Danny Pudi) was her best friend. Now, she’s the new supervisor of a bunch of R&D nerds who don’t like her or her habit of spewing business clichés. Plus, they’re all resigned to doing their jobs, which mainly amount to ripping off Lex Corp designs rather than inventing anything new. Emily is also the fifth manager the R&D team at Wayne Security has had over the last year, and they have learned not care about their ever-rotating bosses. Plus, she’s a business school graduate who doesn’t actually know anything about inventing new devices. All she does is tell them to invent new things, which they point out they have done. I think possibly the best joke, even if I saw it coming, was when Emily implored them all to “think outside the box” and then discover that one of their projects was a literal box. One character invents an “Emily Alarm” to warn when “people you don’t like” are nearby. Just in case you wondering just how much her employees hate her. With the exception of the character Ron—because I think making comedian Ron Funches play someone who isn’t delightful would break the universe—everyone at Wayne Security is relentlessly negative. In the old pilot, the characters were all some flavor of quirky and pretty upbeat. The old Teddy was a practical joker who tried to make the office more fun; the new Teddy is there to puncture her illusions. The old Jackie (Christina Kirk) was a superhero groupie with a cubicle plastered with photos and posters of them, and a failure as Van Wayne’s (Alan Tudyk) assistant; the new Jackie is a world-weary assistant who drops one-liners at her idiot boss. (The best example is her deadpan delivery of “You’re going to be a great father” after he threatens to fill her pockets with rocks and throw her in the river if she lies about Bruce Wayne being on the phone for him again.) If nothing else, Kirk is funny in both versions, showing her range. In the original pilot, Tudyk played Del Heller, the son of the insurance company’s owner, installed when her old boss died. He was obsessed with making money by denying claims, and every act of defiance led to him punishing the office by doing things like taking away their bagels or their desks. He was both a dilettante and a tyrant. He was an angry man-child in the old of the show. Now, Tudyk is Van Wayne—a cousin of Bruce—so desperate to get promoted to a place in the main Wayne Enterprises office in Gotham City that he’s been pressuring everyone under him to come up with something good enough to get him there. That means going through R&D department heads like Emily at a really fast clip. Also, he loves to tout his connection to Bruce Wayne constantly, to the point of his assistant having a running “Bruce Wayne is calling for you” joke. Van Wayne is just as entitled and selfish as Del Heller, but in a more conniving, less pettily destructive way. The original pilot was framed around Emily trying to fight the Heller’s dictates that they deny more of their customers’ claims. The conflict was contained inside the company, basically. The new conflict is that Wayne Enterprises shuts down their branch of Wayne Security, so Emily needs the team to make something amazing that proves they’re worth keeping in business. And then she needs to get Van—who is ecstatic that the closing of the company means he’s getting absorbed into the Gotham City office—to actually present it. It’s a two-sided fight. But it’s one largely resolved by the end of the episode: Emily spurs the invention of something great, it keeps the office open, and Van is sad. The need to keep inventing things to stay employed may come up again, but it doesn’t seem like it’s going to be a driving thread. In the old pilot, it seemed like the fight against the boss was going to be the theme of most episodes. In the original pilot, there was a raging debate about whether or not their co-worker Hank Detweiler was really Green Lantern. The old pilot spent a lot of screen time having the characters try to prove it, including having a character smash a yellow chair over Hank. That running joke—which included Hank being suspiciously missing during villain attacks—is completely missing, as is the character of Hank (at least for now). It’s a casualty of Danny Pudi’s character going from an upbeat superhero fan to a cynical and sarcastic scientist. I’m hopeful it turns up again in another form in a later episode, because it really did work. In the old pilot, Emily’s co-workers Wendy and Marvin—named for the classic but goofy Superfriends sidekicks—were squabbling siblings who happened to work together. Now, Marvin is missing completely and a new actress is playing Wendy. It’s not even clear if her name is meant to be a reference anymore. Another joke has Ron explaining that everyone knows that the “number one cause of office accidents is Superman crashing through windows mid-fight.” Both are solid jokes, but both are jokes based on general public awareness of DC’s superheroes rather than a deeper comics knowledge. It is almost exhausting how many Batman references are in this show. Emily is obsessed with Bruce Wayne’s book on business, quoting it constantly and carrying it everywhere. Van Wayne talks about his cousin all the time and mentions that he’s “very hard to get ahold of.” The end of the show has Batman using something very similar to the “Emily Alarm” the team invented to catch the Joker. Any one of these jokes might have worked. All put together, Powerless ends up with the same problem that the first season of Supergirl had: they keep talking about this guy that never shows up. A charitable reading is that this overload is supposed to make clear how funny it is for these people to be working for Batman and not know it. But it’s overkill. 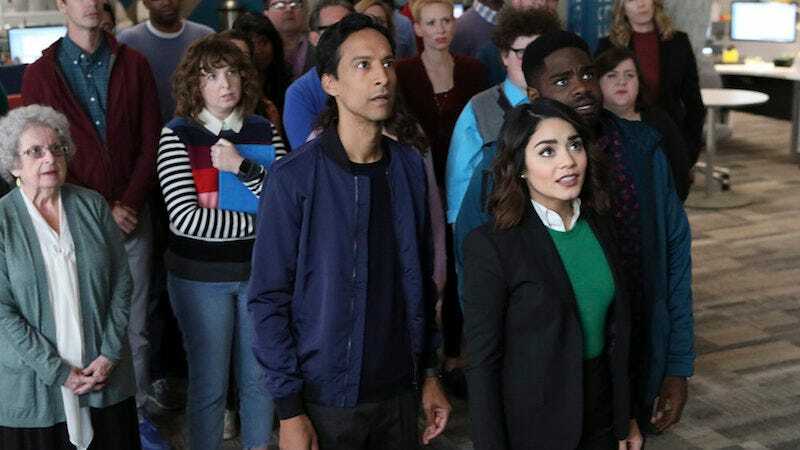 All in all, the new Powerless isn’t better or worse than its original pilot. It’s just very different.